He had the lead in the independent film Sixteen Fathoms Deep (1934) and a small part in Girl o' My Dreams (1934) at Monogram. The last film he made as Creighton Chaney was The Marriage Bargain (1935) for Screencraft Productions. 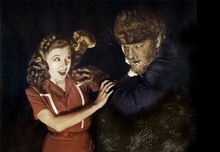 After this point he was billed as Lon Chaney, Jr. until 1942, when he began being usually billed, at the insistence of Universal Studios, with his iconic father's name: Lon Chaney, although the "Jr." was usually added by others when they referred to him to distinguish him from his much more famous forebear. He had a leading role in Indestructible Man (1956) then was back to support parts; Manfish (1956), a Martin and Lewis comedy, Pardners (1956); Daniel Boone, Trail Blazer (1957), The Cyclops (1957) and The Alligator People (1959). 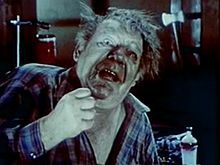 One of his best known roles was a 1952 live television version of Frankenstein on the anthology series Tales of Tomorrow for which he allegedly showed up drunk, though that contention is unsubstantiated. During the live broadcast, Chaney, playing the Monster, apparently thought it was just a rehearsal and he would pick up furniture that he was supposed to break, only to gingerly put it back down while muttering, "I saved it for you." Chaney died of heart failure at age 67 on July 12, 1973 in San Clemente, California. His body was donated for medical research. ^ A kinescope of the January 18, 1952 broadcast is available on DVD, YouTube, and also open to the public for viewing at The Paley Center for Media in New York City and Los Angeles.